We first read about this on Michael Moore's home page and found it rather disturbing. In the very near future, a bill barring Internet sites from publishing or even linking to sites with drug-making information or products is expected to be passed into law by Congress. For more information, see this article. In case you missed it, Cheech Marin appeared on the Late Late Show last night on CBS. Craig Kilborn joked about C & C and their drug use, etc. It was pretty funny. Cheech promoted Nash Bridges which airs every Friday on CBS. 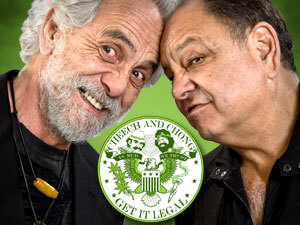 The one, the only Cheech Marin will be on The Late Late Show with Craig Kilborn next week. We'll publish the exact day when it becomes available. UPDATE AIR DATE: TUESDAY NIGHT, APRIL 18TH (actually early April 19th).